Sometimes an idle reading of a blog post (or just about anything, to be honest) can lead me off on an hour-long internet search. The post inspiring such a search today was Charlotte Rains Dixon’s post, Kaizen (Sort of) for Writers. I was drawn to the article because my husband used to have Kaizen days (Japanese for improvement or change for the better, according to Wikipedia) at a former place of work. 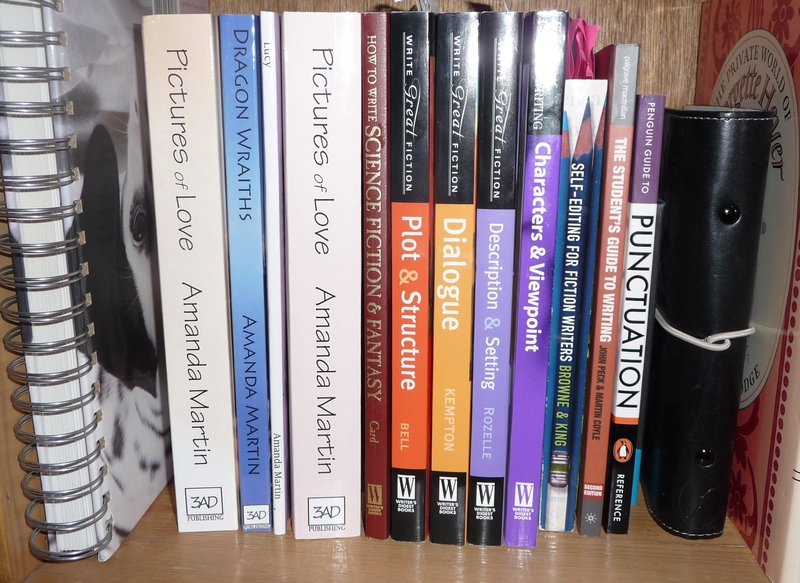 Charlotte’s post discusses ways that writers can introduce small changes for the better into their writing. One of her suggestions was “Learn a few new vocabulary words” and included a link on ‘strong verbs’ which sent me off to read some of Charlotte’s posts from 2008 about improving writing using a thesaurus and a personal word book. 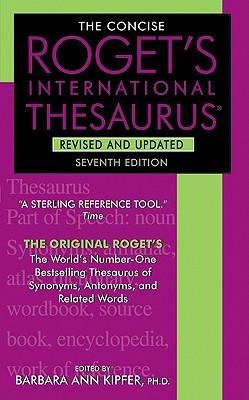 Charlotte’s second post on the subject talked about a particular thesaurus called Roget’s International Thesaurus, which apparently arranges the words thematically (as Roget originally intended) rather than alphabetically. It sounded great, so I went off to find a copy to buy (not that I’m impulsive or need instant gratification or anything). There began my search, as that version appeared to be quite pricey and hard to come by in the UK. I started looking round for something similar, reading reviews to understand the differences. Then I came across an essential review pointing out that International meant American. I already struggle with distinguishing between English and American spelling, spending too much time with a dictionary to ensure consistency in my writing. The last thing I need is an Americanised thesaurus. So then I started looking for other versions of thesauruses, reading reviews which appeared to mostly complain that the type was too small or the book too huge. Kindle versions seemed a good idea until I realised they aren’t always searchable. The comments on this article were as informative as the original article and ranged from complete agreement to disagreement. Philip Dragonetti suggested that, “A Thesaurus is to be used only to transfer words from one’s passive vocabulary into one’s active vocabulary.” That’s exactly it: I know the words I want to use, but sleep deprivation and too much time spent watching Cbeebies, has reduced my vocabulary considerably since my student days. Another article that my morning of internet searching produced was called Is the Thesaurus Your Friend? This interesting post discusses how writers are divided over the value of the thesaurus (as I had already seen in the comments on Charlotte Rains Dixon’s post above). She explains that King believes the best word is the one which flows from our creative subconscious and if you have to look up a word you probably don’t know it well enough to use it. 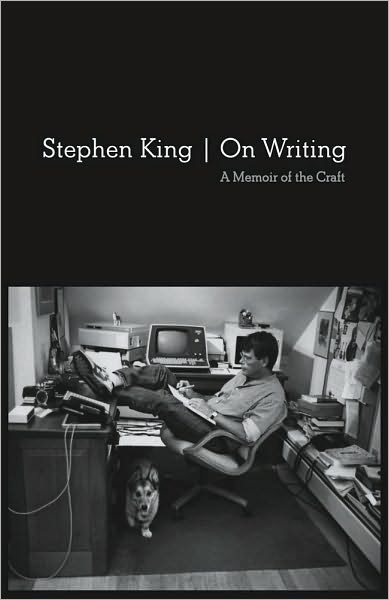 I’m not sure I agree with that view, even from as celebrated an author as Stephen King. As I’ve already said, sometimes I know the word and can’t find it. My creative subconscious is working hard on the plot and story and isn’t too concerned with the words it uses to get the idea on the paper. As someone famously wrote (though my Google search has not revealed who – maybe even Stephen King!) A first draft is the version we write for ourselves. I think Stephen King’s advice is about not using words we have never heard of, just because they’re a synonym for a word we do know. I would like to think writers wouldn’t do that, not least because if a writer doesn’t know the word, chances are the average reader may well not know it either, and so it ceases to function as a means of communication. I’m still determined to get a paper thesaurus, although I might just wait until I find one kicking about in a charity shop. My sleepy brain needs all the help it can get. Besides, Stephen King probably has a much wider vocabulary than I do! Claire sat at the front of the coach and chewed her lip. This is ridiculous. I feel like a twelve-year-old on a school trip, wondering if the boy at the back of the bus will come and hold my hand while we both ignore each other. Since the kiss that morning, Neal hadn’t renewed his attentions. She could hear him somewhere up the aisle, entertaining his fellow travellers with an anecdote about a Soho nightclub at 2am. She knew if she turned around it would look something like the sermon on the mount, as the teenagers hung off his every word, as much impressed by his experience as snared by his charisma. I should be flattered that he pursued me through the forest, although I could wish that he hadn’t. She could wish it, but did she? There was no doubt that it was flattering to have a man like him chase her down. If only she could figure out what he was after. Surely there were easier conquests. There are probably a dozen girls on this bus only too happy to massage his ego, among other things. Staring at her iPad, Claire tried to concentrate on the notes she was compiling on the morning’s activities. After the walk around the Ruakui Reserve, they had stopped for breakfast before heading to Rotorua. She’d managed to stay out of Neal’s way at the farm show and during the zorbing. No one was going to get her inside an inflatable hamster ball and throw her down a hillside. Carl and Julia would’ve had a field day finding activities for me in this damned country. Everybody seems hell-bent on killing themselves one way or another. If it isn’t jumping off something it’s dropping into a hole in the ground or flinging themselves down a hillside. Crazy people. Crazy country. Their next stop wasn’t likely to prove any better. Agroventures Adventure Park. I don’t even need to read the brochure to know I’m going to spend the next few hours hiding. The only provocation Neal had offered at the zorbing place was a raised eyebrow. Maybe he’s given up on his Chicken crusade and has accepted that I am, in fact, a coward. Even as she thought the words she felt the heat rising in her chest. Why was it so hard to let a man like him think she was afraid? The driver grinned at them as they gathered in the car park. Claire felt like punching him and wished she’d paid more attention to the details of the tour before signing up. Surely there was a trip around New Zealand that didn’t involve being guilt-tripped into crazy adventures every five minutes. The old fogies tour or something. Although some of the people she’d seen climbing into the plastic zorb balls earlier that day hadn’t exactly been spring chickens. Claire felt hot breath on her neck and shivered as the low voice penetrated into her gut. She drew air deep into her lungs before turning round. Neal stood far too close and she took a step back, causing his eyes to crinkle in amusement. The primness of her tone made him chuckle and Claire cursed. That damned chuckle was going to be her undoing. It made her legs wobble. He grinned and Claire felt a responding flutter deep in her stomach. Claire had seen the swoop. Plunging to earth in a sleeping bag with her arm wrapped round Neal’s was not going to happen, ever. She wanted to walk away. The urgent message to her feet wasn’t getting through; they remained stubbornly stuck to the ground as Neal turned on his most sardonic stare. Claire bristled at the accuracy of his barb. So, the Shweeb was a bike? How hard could that be? A quick glance down at Neal’s legs revealed the contours of an athlete. No. But, after all, it was only dinner. What harm in that? And she had to do something worth writing about on the blog. A bike ride sounded easy enough. Claire looked up at the suspended monorail pods hanging like giant fruit on a silver vine. She traced the rail with her eyes, noticing the curves and corners and shuddered. Numbly following the chattering group into the launch area, she allowed herself to be guided into the glass pod. Claire listened to the instructions as best she could through the buzzing in her ears. Glancing to her left she could see Neal grinning at her through the window. The cage shook as someone slammed the door shut. Then she felt a shunt as she was pushed out towards the exit. Claire almost forgot to peddle, but the forward momentum kick-started her legs without applying to her brain for permission. Clinging onto the handle bars she peddled furiously, muscles burning in reminder of the months since her last spinning class. Just as she was about to relax and enjoy the physical sensation the pod swung out sideways, leaving her stomach somewhere behind on the curve. Claire swallowed the nausea and focussed on her breathing. She didn’t dare try and locate Neal, although she sensed the pods crossing over each other as the monorails weaved and twisted. Even though she knew there was no chance of beating him, Claire dug in as hard as she could. Claire had lost all sense of how many laps she’d done, until she saw a flag waving to indicate it was her final time round. Dropping into a lower gear she pushed hard, determined not to be humiliated. She pictured the smug expression on Neal’s face were he to win and pedalled harder. As the pod slid into the finish point, Claire let her legs drop from the pedals. Someone opened the door and Claire turned, relieved to be able to escape her torture chamber. Claire looked up into the face of her nemesis. His skin glistened, but there were no other visible signs of exertion. He’d finished in enough time to come and help her out her pod. Ignoring the outstretched hand, Claire climbed out of the machine. Her knees buckled and she felt Neal’s arms around her, keeping her from falling. He waited until she was standing upright, then brushed his hand down her sweaty back; leaving it lingering on her bottom. Before she could protest he stepped away and was gone.